For the biological cat family, see Felidae. Cats are a group of carnivorous mammals with sharp teeth and retractable claws (except in the case of the cheetah) on their paws, originally distributed worldwide apart from Australasia, Madagascar and Antarctica. Several of the larger kinds of cat can be dangerous to humans. The domestic cat, believed to derive from the African wildcat, has been used to control vermin or kept as a pet for thousands of years, and worshiped as a god by the ancient Egyptians, amongst others. Today, the domestic cat, sometimes affectionately known as a kitten when it is young, remains extremely popular as a pet; there are an estimated 76 million pet cats in the United States. Species of cats include the lion, tiger, leopard, cheetah, jaguar, puma, cougar, ocelot, lynx, caracal, serval and many smaller types. There is some disagreement about whether cats form one common baramin or if they come in two distinct kinds. While there are a good deal of characteristics in common, all small cats share a second set of vocal cords which allow them to purr, and the only large cat with this characteristic is the cougar. 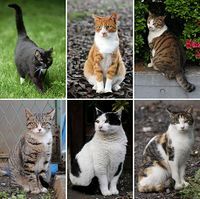 A feral cat is a direct descendant of a domestic cat but is untamed and generally frightened of any human contact. A feral cat is usually one that has returned to the wild, foraging for food and living in areas with open space. This is usually as a result of someone abandoning a cat (or cats), some of which are able to survive in the wild and breed, which leads to the establishment of a colony of feral cats. Such colonies usually exist for social and mutual protection purposes, but individual cats within each colony are expected to find their own food. The life of a feral cat is usually difficult, and many do not survive for very long, due to various factors such as having to catch their own food, inadequate shelter from the elements, encounters with other animals (skunks, raccoons, etc.) or dogs or other feral cats, dangers from vehicles on roadways, and not receiving medical treatment for illnesses or injuries. Cats as domesticated animals (pets) on average are afforded better care and thus have a better quality of life and longer life spans. A stray cat is a cat that is unowned, but generally accepts human touch, may take food directly from a human, etc. The terms are often interchangeable, especially in popular usage. Cats were revered by the ancient Egyptians, possible the earliest significant appearance of cats in writing being in Egyptian texts. Cats are absent from the Bible, save for in the apocryphal book the Baruch. In medieval times, cats were associated with witchcraft and evil, particularly black cats. In more recent years, cats are still imagined as lazy, apathetic, or mean. In 2009, The Star reported: "China's Chengdu Business Daily estimated recently that as many as 10,000 cats are consumed throughout Guangdong everyday." On December 20, 2019, in its article on cat eating, Wikipedia (an online encyclopedia founded by an atheist an agnostic) declares: "In Guangdong, cat meat is a main ingredient in the traditional dish "dragon, tiger, phoenix" (snake, cat, chicken), which is said to fortify the body." China has a cat meat trade (see: Communist China and cat meat eating). CAPP reports that the cats at the slaughterhouse were in terrible condition, many emaciated and sick, crying out from being crushed together in the cages. There were piles of cat hair outside, the remains of countless thousands of cats slaughtered at the site in the past. ↑ "Cat." Encyclopedia Britannica Online. ↑ Taxonomy and Biology. Pearson Press. This page has been accessed 35,165 times.